In the latest installment of Review of Qur’anic Research 2 no. 6, W. S. Chahanovich reviews Les origines du Coran, le Coran des origins, a volume edited by Francois Déroche, Christian Robin, and Michel Zink. 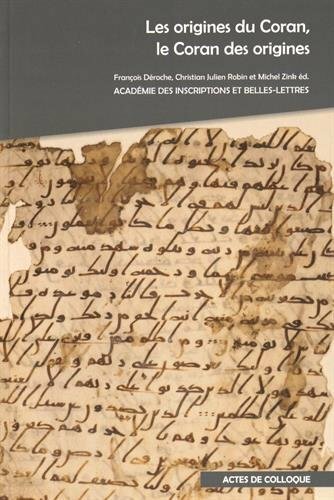 Les origines is a testimony to the robust tradition of European qur’anic scholarship and provides the reader with focused contributions touching on several topics, including qur’anic philology, paleography, epigraphy, and codicology. Comprised of fourteen articles – nine French, one German, three English –Les origines is the result of a conference held in 2011 in France that honored the 150th anniversary of the publication of the first edition of Theodor Nöldeke’s groundbreaking work Die Geschichte des Qorâns (1860). There are numerous Qur’an manuscripts, complete and partial, dating from the first century A.H. onward. 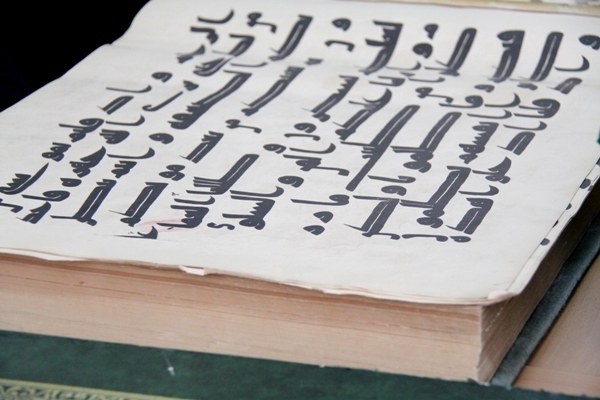 Although there is no official count of Qur’an manuscripts in existence today, Muhammad Mustafa Al-A‘zami (2003) estimates the number at about 250,000. 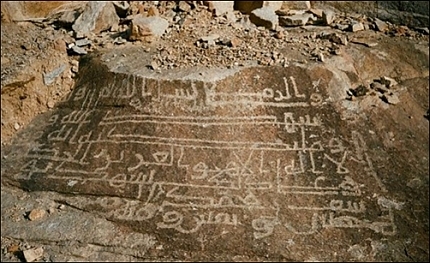 They may be found in mosques, museums, libraries, and institutions all over the world. In the past century, several early manuscripts have been published in facsimile editions, which reproduce as closely as possible the texts in their original manuscript forms, and may be purchased from specialized centers like IRCICA or borrowed from university libraries. Facsimile editions offer researchers in Qur’anic studies and Arabic paleography easy—if indirect—access to early Qur’an manuscripts. The following is a concise chronological survey of select facsimile editions of early Qur’an manuscripts, including original title, date of publication, and—when possible—an estimated percentage of the total text of the Qur’an represented in the manuscript/facsimile. 1- Coran coufique de Samarcand: écrit d’après la tradition de la propre main du troisième calife Osman (644-656) qui se trouve dans la Bibliothèque Impériale Publique de St. Petersbourg. Ed. S. Pissaref. St. Petersberg, 1905. In 1905, the Russian orientalist S. Pissaref published a facsimile edition of the famous Samarkand Qur’an (now Tashkent) attributed to the third caliph ‘Uthman. Many Muslims today, in Central Asia and elsewhere, believe that the Tashkent manuscript was ‘Uthman’s personal copy of the Qur’an, from which he was reading when he was attacked and killed in 35 A.H./656 C.E. It is estimated that the manuscript originally consisted of about 950 folios, but over the years individual folios were removed. Pissaref’s facsimile edition includes 353 folios. In 1992, fifteen of the original folios were stolen and sold in auctions, so today only 338 folios of the manuscript remain. 2- The Unique Ibn al-Bawwab Manuscript: Complete Facsimile Edition of the Earliest Surviving Naskhi Qu’ran, Chester Beatty Library, Dublin, Manuscript K. 16. Ed. D. S. Rice. Graz, 1983. This is a complete facsimile edition of the famous naskhi Qur’an manuscript of Ibn al-Bawwab written in 391 A.H. and preserved in the Chester Beatty Library (No. K.16). 3- Sources de la transmission manuscrite du texte coranique. Eds. François Déroche and Sergio Noga Noseda. Lesa, 1998-. The first volume (1998) is a facsimile edition of a Hijazi manuscript from the Bibliothèque nationale de France (Arabe 328a), consisting of 56 folios representing about 25% of the total text of the Qur’an. The second volume (2001) is a facsimile edition of the oldest Qur’an manuscript from the British Library (Or. 2165). The original manuscript consisted of 121 folios representing 53% of the total text of the Qur’an, but the 2001 facsimile edition includes only the first 61 folios, with the remaining scheduled for future publication. 5- Koran ‘Usmana: Sankt-Peterburg, Katta-Langar, Bukhara, Tashkent. Ed. Efim Rezvan. St. Petersburg, 2004. This is a facsimile edition of the “Qur’an of ‘Uthman” (St. Petersburg, Katta-Langar, Bukhara, Tashkent), containing about 40% of the total text of the Qur’an. 6- Al-Muṣḥaf al-sharīf: Attributed to ‘Uthmān ibn ‘Affān (The Copy at the Topkapı Palace Museum). Ed. Tayyar Altıkulaç. Istanbul, 2007. Al-Muṣḥaf al-sharīf al-mansūb ilā ‘Uthmān ibn ‘Affān: Nuskhat matḥaf al-āthār al-turkīyah wa’l-islāmīyah bi-Istānbūl. Ed. Tayyar Altıkulaç. Istanbul, 2007. Al-Muṣḥaf al-sharīf al-mansūb ilā ‘Uthmān ibn ‘Affān: Nuskhat al-Mashhad al-Ḥusaynī bi’l-Qāhirah. Ed. Tayyar Altıkulaç. Istanbul, 2009. In 2007, Tayyar Altıkulaç published facsimile editions of two Qur’an manuscripts attributed to the third caliph ‘Uthman. The first, at the Topkapı Palace Museum (No. 44/32), is an almost complete manuscript, with only two folios missing and representing over 99% of the total text of the Qur’an. The second, at the Turkish and Islamic Art Museum (No. 457), is also almost complete. 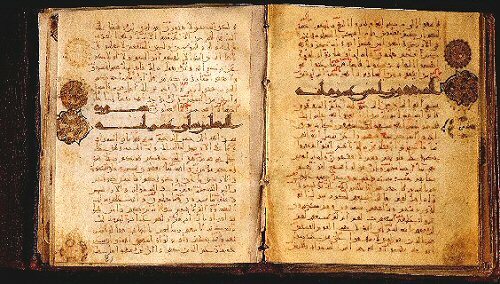 In 2009, Altıkulaç published a facsmile edition of another manuscript attributed to ‘Uthman at the Central Library of Islamic Manuscripts in Cairo, which has more than 99% of the total text of the Qur’an and only 4 folios missing (while some other folios were rewritten in a later hand). 7- Al-Muṣḥaf al-sharīf al-mansūb ilā ‘Ali ibn Abī Ṭālib: Nuskhat Ṣanʿāʾ. Ed. Tayyar Altıkulaç. Istanbul, 2011. This is a facsimile edition of the manuscript attributed to the fourth caliphs ‘Ali at the Great Mosque in Sana‘a. It contains about 86% of the total text of the Qur’an. More facsimile editions are expected to be published in the coming years by scholars like Tayyar Altıkulaç, François Déroche, Efim Rezvan, Alba Fedeli, and others. It is also worthwhile to note that Qur’an manuscripts are not only being published as facsimile editions but also in digital format. The Corpus Coranicum project has been working on digitizing ancient Hijazi and Kufic manuscripts since its launch in 2007. * Ahmed Shaker is an independent researcher on Qur’an manuscripts.